​Boxes are intriguing artistic structures able to house whole narratives that can delight and inspire the viewer. They offer a fabulous means of communicating ideas for the artist using simple and inexpensive materials and equipment. Learn to make your own box, step-by-step, from scratch, creating your own narrative with personal objects and ephemera. ​Suitable for all levels, including beginners. "Essaouira Box" - box and mat board, gesso, silverpoint drawings. 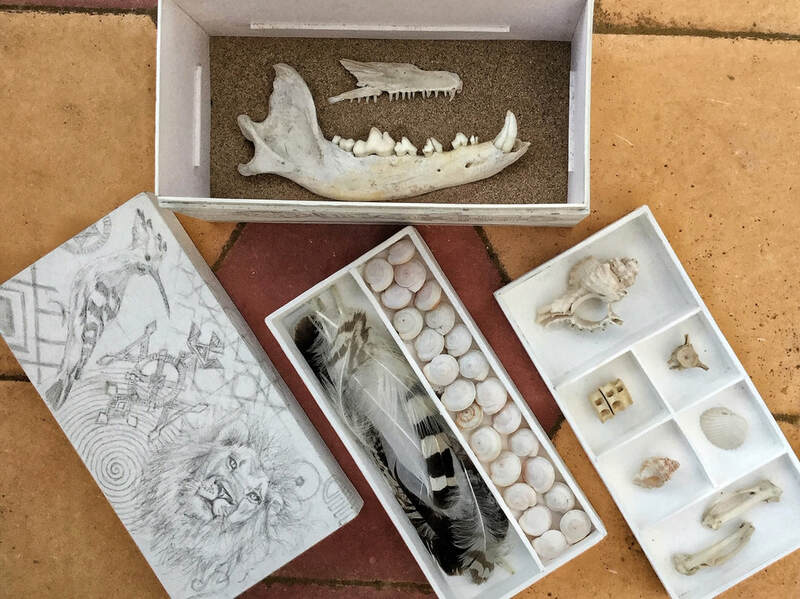 Containing Essaouira beach finds: sand, shells, bones and feathers. "Artist's Box - Paleolithic" - wallaby fur, shells, flint, agate, coral, red ochre, charcoal, yellow ochre, boar tusk, paper collage, string, box board, mat board, unryushi paper and foam core. 15 x 15 x 5 cm - Sonja Georgeson.